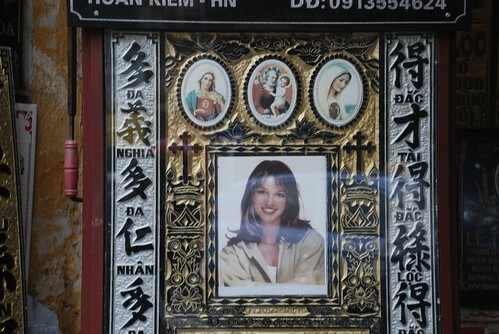 I don't know if Britney Spears is still alive or if she's passed away but in Vietnam, her gravestone has been on display in Hanoi's Old Quarter for years. She has had so many scandals related to her personal life and in her career that it makes me wonder if this has had influence on her downfall. Interesting, too, that the Virgin Mary is prominent alongside Britney. She surely must have given up on her by now? If anyone's heard about her lastest news, please stop by because I am really concerned. Holiday is coming and I am so excited about that. I have been planning this trip for quite awhile and Greece is my next destination. I went to the Greek Embassy this morning to apply for my visa. I am a bit worried even though I shouldn't be. I met a Vietnamese member of the embassy staff and she's a really nice woman. She showed me how to prepare all of the papers and introduced me to the visa officer. I have to wait for a few days before they call me for an interview. I hope everything goes well and they will accept my visa. Wish me luck !!! Summer is well and truly here. You can hear the cicadas in the trees. 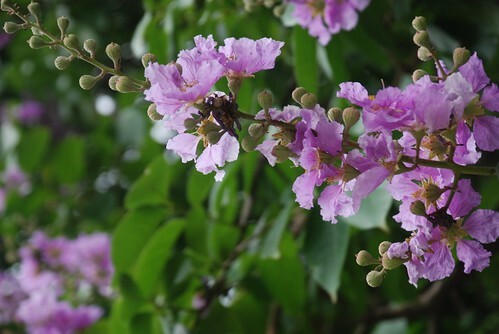 Along most of the streets in Hanoi these days, you can see the beautiful Flamboyant flowers. The hand fans are waving and the storm clouds are threatening. 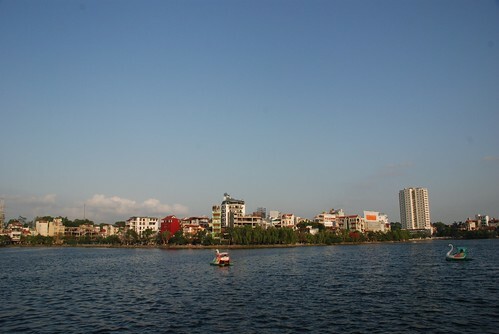 The temperature is on the rise forcing Hanoians to the lakesides and the streets in the evenings trying to get some breeze. Young boys drive their motorbikes around to have a good look at girls. Ice cream and sugarcane juice outlets are doing a roaring trade. 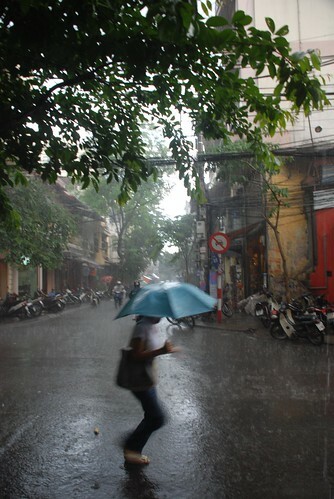 It’s all about staying cool in the brutal Hanoi summer. 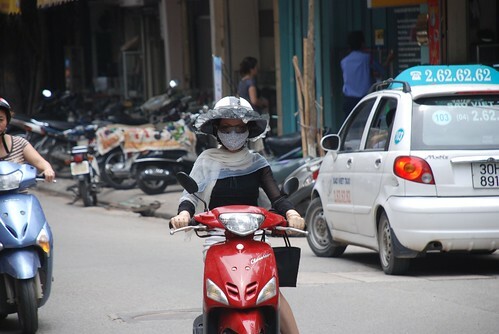 While the red and purple flowers make Hanoi look beautiful and signal the beginning of the school holidays, it is also a sign that it’s time to adapt. There will be no more cool days until October. One of the most noticeable ways that Hanoians adapt is in the wardrobe department and that doesn’t mean they wear less clothes. They wear more! 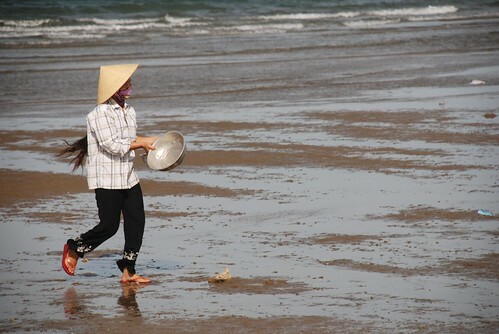 Avoiding the searing sunshine is a priority, especially for the local women. A range of uniquely designed shirts which tie around the head have been all the rage these past few summers. Long gloves and the newly invented helmet rings complete the look. Driving habits change, too. Motorcyclists do not stop at the traffic lights but instead 25 or 50 metres back from them – under the shade of a tree. It seems that half a minute stopped still in the open sun is too much to bear. At other times, motorbikers compete to pull up in the shade of a truck or bus. Motorbike parking attendants, in some locations, cover the seats of the bikes to protect them from the sun and their owners from a nasty burn. Finding a breeze on a hot still night requires inside knowledge or an observant eye. Between Truc Bach and West Lake is an all too obvious one, with hundreds of couples getting in their good night kiss in the subtle wind. The breeze from the Red River can be experienced by hanging in the stop zones on Long Bien bridge. The bases of tall buildings like the Sofitel Plaza and by the waterworks on the dyke road are two other favourites. 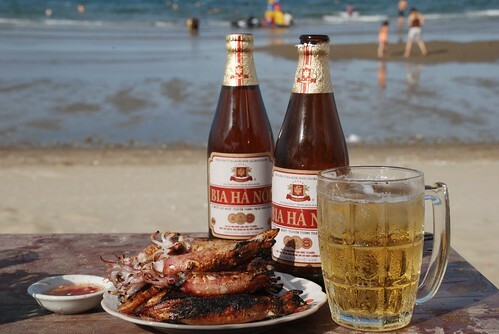 A tumbler or two of bia hoi (draught beer) or mia da (sugar cane juice with ice) will give an instantaneous chill. If all else fails, seek air-conditioned comfort! 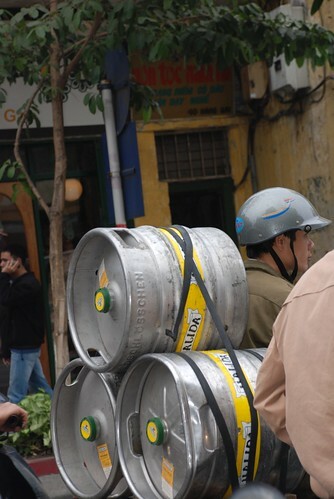 Last weekend, I joined my friends from the Sofitel Plaza Hotel on their staff trip to Cua Lo. It was a fun trip organized quite well by the Oriental tour company. The journey was a bit too long for my liking, taking 8 hours by bus on the way and 9 hours on return due to the crazy traffic on the highway. Besides a small problem with the servise at the hotel, we all had such a great time, swimming, walking along the beach and enjoying the fresh seafood. Having a beer and a massage on the beach is hard to beat. Cua Lo Beach is just an average beach. It doesn't have the whitest sand and the strong wing could blow anything away even your swimming costume. After 10 mintues lying on the chair, my body was covered with sand and dust plus over 20 sellers crowding around to sell their products, from fresh seafood to massage. I wonder why there are so many of them allowed to do business on the beach. Almost half of them are kids. These kids should be at school studying, not working on the beach selling eggs, peanuts and massage. 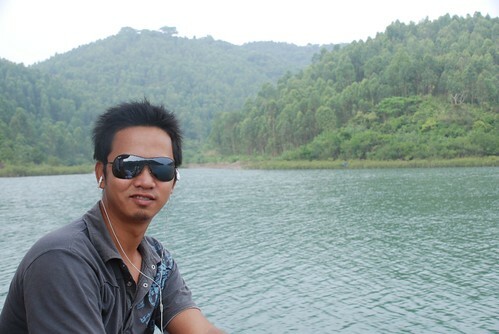 Mosts of the people working at Cua Lo are from the provinces around Nghe An Province. I suppose it is an acceptable job with a reasonable income that they can cover their daily life and help their families. In the main street, there are too many hotels around for such a small town. Difference prices are charged during the weekend and special holidays from early in the week because most Hanoians come here for weekend breaks. 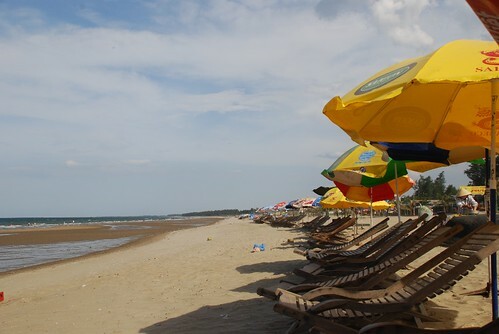 In fact, in the summer holidays, there are so many people on the beach it is difficult to relax. 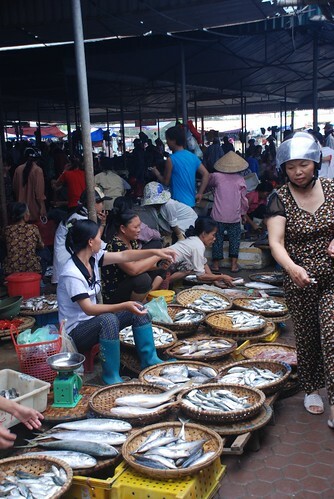 I liked the seafood market in the town as things are really well organized, there is a great atmosphere and the people there were friendly, insisting that i take their photograph. 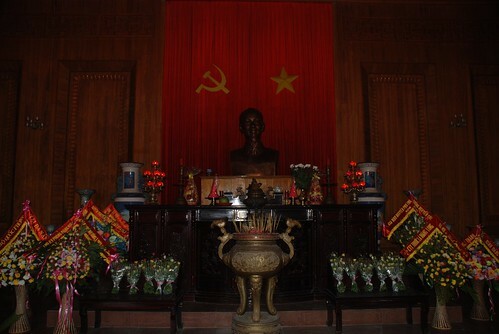 We went to Uncle Ho's home town for a short visit. I learned a lot from this visit and had heard heaps about it. His family lived in such a simple house, much like other families did and thanks to the local tour guide, who told us about the history and the life conditions in the old days. Cua Lo people are generally very friendly and sweet. I'm not sure but maybe the financial pressure of living in this poor province is turning them into very commercial people. Buying things here requires you to bargain harder than other places and they have two different prices. There seems to be a price for right weight scale and the cheating scale. 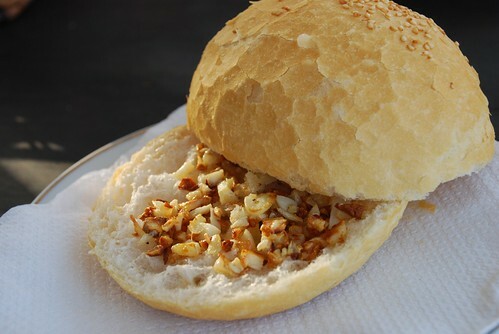 I hate this and I shouted at a lady once as I paid more than my friend but had 200 grams of dried seafood. 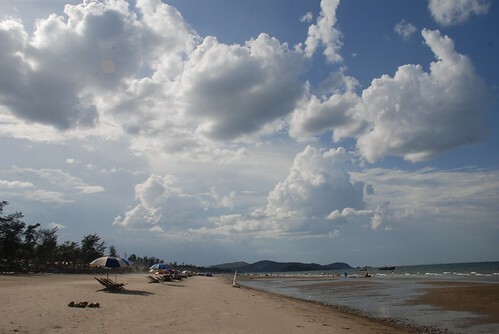 Thinking about the beach and considering the distance from Hanoi, Cua Lo is a bit too far for a weekend break. But...been there, done that!